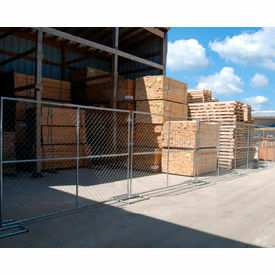 These barriers are designed for use as a temporary construction safety barrier. These barriers feature a galvanized finish and welded steel construction for added durability. 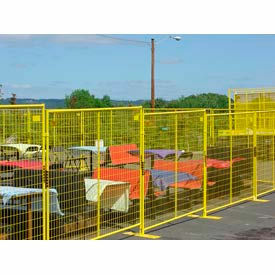 The panels feature a 10 gauge chain link fence that is secured to the barrier with steel ties. Dumpster Enclosure Hides and Encloses Your Dumpster and Outdoor Receptacles Easily and Economically. 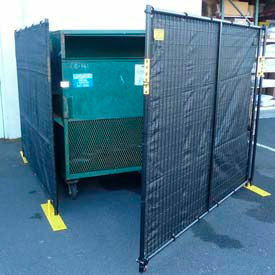 The Dumpster Enclosure hides and protects your dumpster and recycling from unauthorized dumping or poaching. Also helps to contain excess trash from blowing around your property. All welded 7' 6" fence panels assemble easily in standard configuration or arrange them to fit your specific building. 2"x 4" welded wire mesh supports wrap around fabric black cover (included) that is fitted to panel height and easily attaches to panels through sewn in grommets. Available with 3 Sided Enclosure or 4 Sided Enclosure with Door.